The lion was only 10 yards from our vehicle. The driver/guide had no rifle. The truck had no doors or windows. But our guide said not to worry. 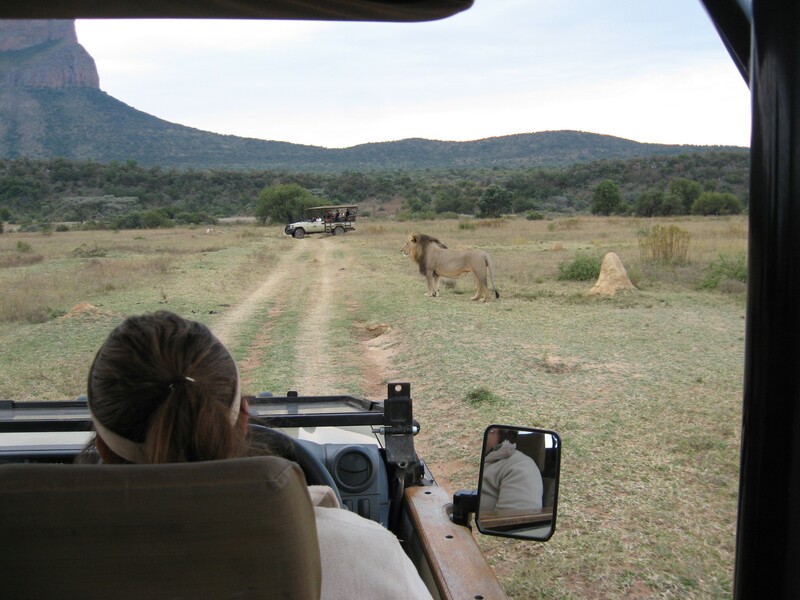 The lions view these Safari trucks as large animals — too big to take down and kill. So as long as we respect them and don’t get too close (that is a relative term, in this case), we really didn’t need to worry. But don’t get out of the truck! She told of one Japanese tourist who ignored the warning, climbed down, and went behind a bush to relieve himself. They realized he was gone when they noticed a lion stalking something — the tourist! In John 15, Jesus tells us to abide or remain in Him, and to obey His commands. We get into trouble when we stray. Like the Safari vehicle and the lion, Jesus is much bigger than Satan. When we stay within His sphere of protection we are safe. Who shall separate us from the love of Christ? Shall trouble or hardship or persecution or famine or nakedness or danger or sword? … No, in all these things we are more than conquerors through him who loved us. For I am convinced that neither death nor life, neither angels nor demons, neither the present nor the future, nor any powers, neither height nor depth, nor anything else in all creation, will be able to separate us from the love of God that is in Christ Jesus our Lord. Romans 8:35, 37-39. What kinds of dangers are you facing? Are you staying in Christ or straying from Him? Love the word picture! fIt helps to recognize the enemy as a man-eating, hungry lion. I’m less likely to mess with him. That’s a picture I need to stick in my mind!